BUILD WITH BRANGUS ON THE AMERICAN RANCHER! Santa Rosa Ranch was pleased to be featured in the August 31, 2015 episode of The American Rancher, highlighting the Brangus breed and the advantages that our cattle provide to commercial cattle operations globally and across the United States. Contact us about our Bulls and Replacement Females. Every day is Sale Day at Santa Rosa Ranch! Santa Rosa Ranch appeared in The American Rancher's "Build With Brangus - The Right Cattle For The Right Reason" on RFD-TV in August 2014. This is our commercial that ran during the program. RFD-TV's The American Rancher aired 'Build with Brangus - The Right Cattle For The Right Reasons' in August 2014. The programs was produced by the International Brangus Breeders Association and Superior Livestock/Superior Productions. 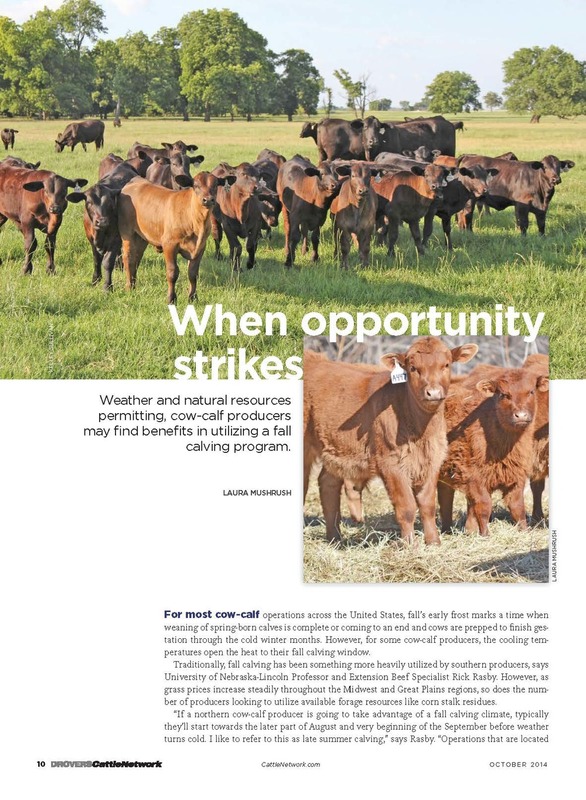 Santa Rosa Ranch was a proud participant in the program, with interviews from Kelley Sullivan and Kent Smith, highlighting the significant advantages that Brangus and UltraBlack cattle bring to the commercial market. Bastrop, TX-----After a century in the cattle business and over 40 years of producing top purebred Brangus cattle, XS Steiner Ranch Brangus has dispersed their entire cattle herd to Santa Rosa Ranch. Over 1,000 head of females will be relocated to Santa Rosa Ranch along the Trinity River in Houston County and will complement the growing herd of purebred Brangus and Ultrablack cattle that have been developed in their program. Santa Rosa Ranch was founded by the Gerald and Susanne Sullivan Family and has locations in Grimes and Houston Counties. Under the guidance of GM Kent Smith and Manager Scott Broadus, Brangus and Ultrablack seedstock are developed from the genetic foundation of Brinks Brangus, Gardiner Angus and V8 Brahman cattle. Recently, the program expanded to the historic Rattlesnake Ranch/7J Stock Farm in Houston County, offering expansion opportunities for their current purebred and commercial operation as well as bull development, replacement female and weaned calf programs. For more information about Santa Rosa Ranch, log on to www.srrtexas.com or call 936.624.2333. With the changing rural landscape due to drought or development, there are landowners who still maintain their commitment to holding their land for agricultural production. The state of Texas boasts some of the most famous farms and ranches in the United States, and one of those is entering a new chapter in their storied history. The Rattlesnake Ranch/Seven J Stock Farm was one of the first ranches incorporated in Texas and has been held by the same family for more than 65 years. Here is your question of the day: How can you put farmers, ranchers, horticulturists, regulatory agencies, scientists, bankers and attorneys in one room and expect peace and harmony? 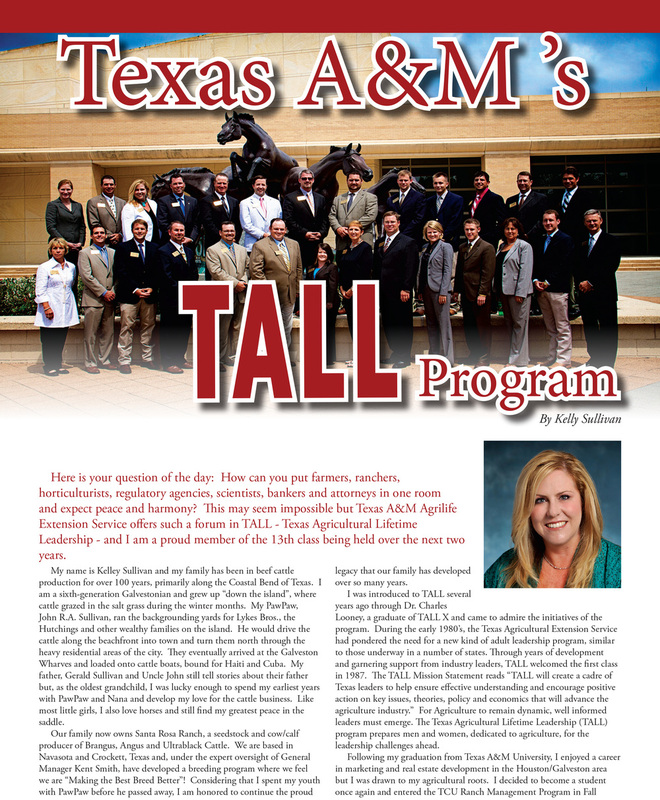 This may seem impossible but Texas A&M Agrilife Extension Service offers such a forum in TALL - Texas Agricultural Lifetime Leadership - and I am a proud member of the 13th class being held over the next two years.